Sounds yummy, huh?! 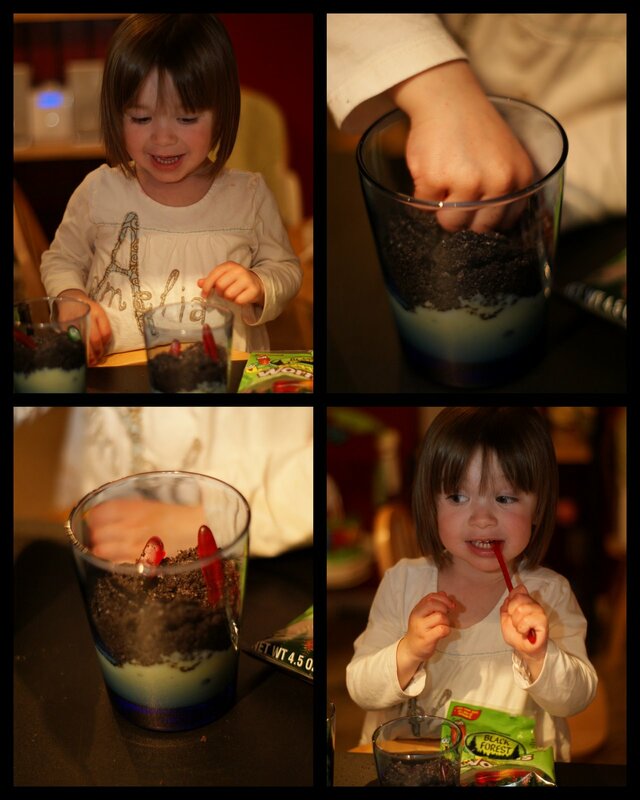 Amelia loves to find worms in the dirt outside, which inspired me to make a dirt dessert for FHE. We made vanilla chocolate chip pudding, crushed some oreos, and stuck in gummy worms into a glass. It is actually really delicious and fast! Too bad it is not healthy too. 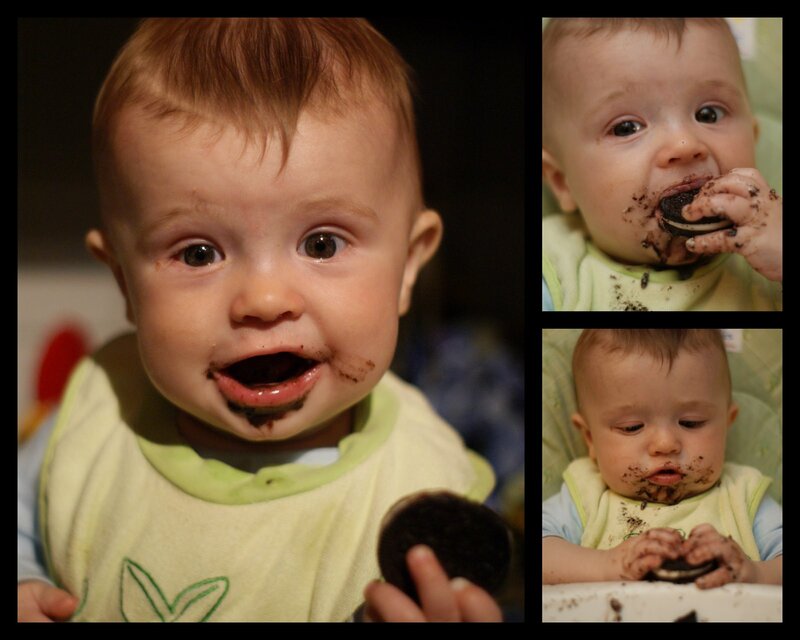 Justin gave Phillip and oreo to enjoy, boy did he enjoy it. I think he actually ate 2 or 3 cookies. He had cookie crumbs stuck in his neck rolls, behind his ears, and in other cracks. Yep, he went sink tubbing. 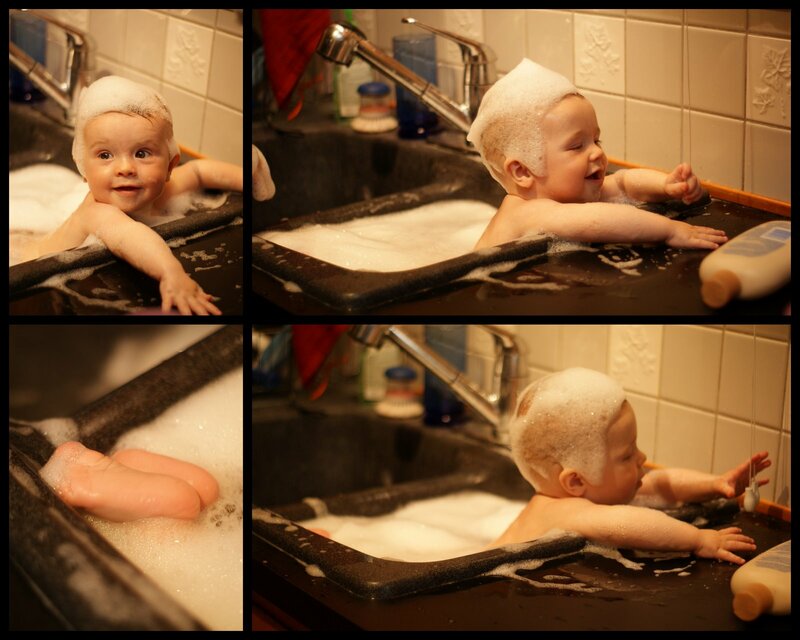 Sink bathing is really convenient. It is fast, at waist height, and perfect for sitting babies. The main attraction were the blind tabs. Our FHE lesson was on saying "I am Sorry." Amelia spends more time in time out for not apologizing than she should. I think she enjoyed the role-playing since mommy had a tantrum and went to time out until I apologized for hitting daddy. Our family LOVES the Nursery Manual for FHE. Fast, quick, and perfect for little toddlers. Here are some of the projects completed in the past week. 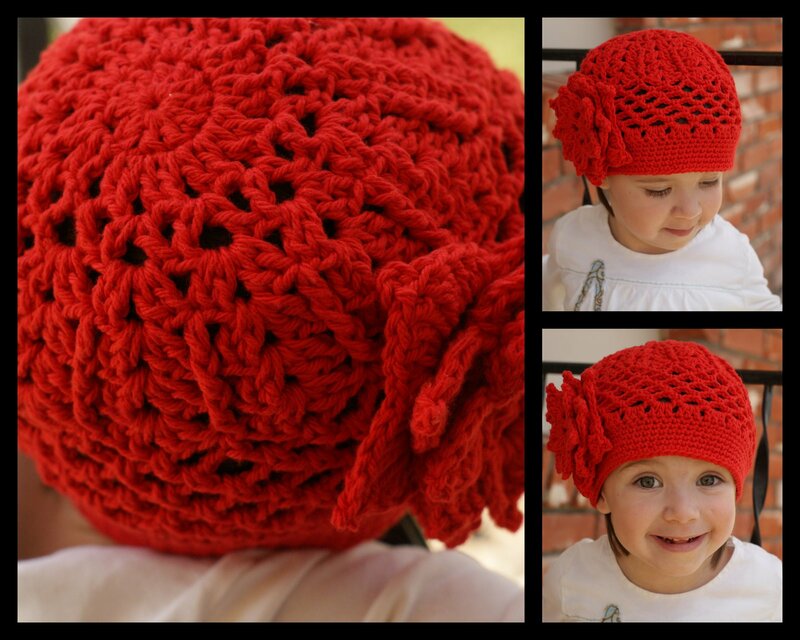 I am having sooooo much fun creating, sewing, and trying on the clothes on my kiddos. Some are cuter than others. Hey, that is what happens! Sometimes my ideas fall short (like not so sure about the orange and pink shirt). Amelia inspired the ballerina shirt with her newfound love of ballerina music, ballerina flats, and her toot-toot. She wore her undershirt, tutu, tights, and flats all day. After dinner she came up to me and said, "Mom, I am a tired ballerina girl. Let's take it off and go to sleep." She did go to her bed, mostly to enjoy some binky time. What a funny little girl. She called me "darling" all day yesterday. 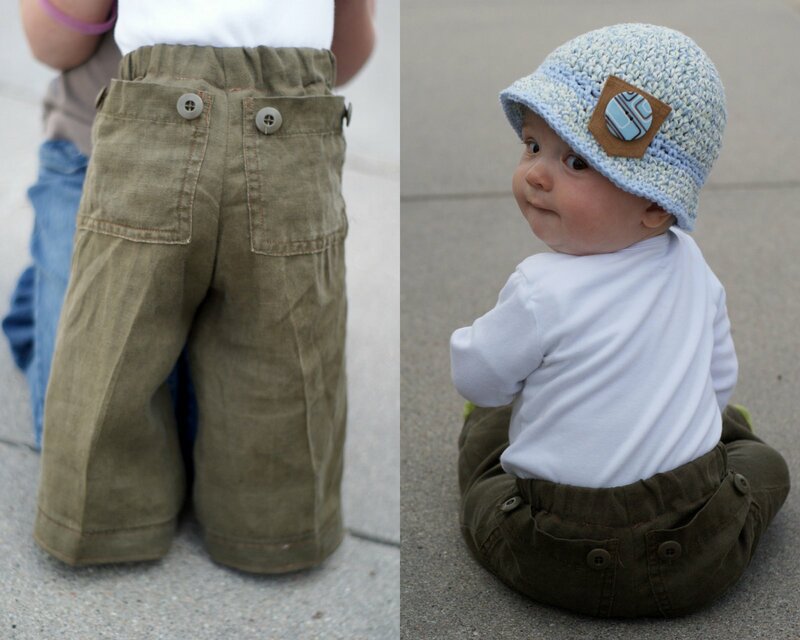 The pants on Phillip are repurposed from a pair of ladies linen capris. I took my favorite pair of Phillip's pants, pinned them to the legs and cut away. They are a little wonky and long but still adorable. Good thing I have another pair of slacks to repurpose for him! The inspiration came from Dana at the Made website. Next pair will have knee pads on them! Last night a thunder storm rolled through Sidney. After Phillip went to bed Justin, Amelia, and I went outside and sat on the sidewalk looking for lightening and listening for thunder. Amelia was snuggled in between Justin and I happy as a lark. She danced in the rain and let me twirl her around. She talked on and on about the rain, the lightening, and being with Mommy and Daddy. At first she kept talking about wishing on a red star. Justin was confused until he noticed a red warning light on a tower in the distance. We made wishes on the red star! The experience was so tender for us all. Amelia tried to recreate it this evening. Alas, there was no storm and Daddy was gone at work until 10:30 pm. As we sat on the sidewalk snuggled together she asked me where daddy was...because her other leg was cold. Justin just brought me home a potted flower plant! I told him about 2 weeks ago I needed some fresh cut flowers (like gerbera's). Last night on Facebook I made a comment that he had not delivered yet. Ha ha, pressure.